Hi everyone. I had a lot of fun making today's card ... not only is it an adorable image from Bugaboo, but I paper-pieced it - one of my favorite techniques. 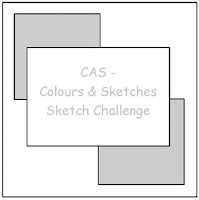 This card is for three challenges: Bugaboo December Theme (Holidays / Winter); CAS - Colours & Sketches #5 - Sketch; and SCS Monthly Fan Club (Baby's it's cold outside). As I mentioned above, I paper pieced this sweet skating penguin. I sponged around the outside of the gray pieces to give him more depth ... and also partially cut out the wing, sponging around the edges as well. I glued a small piece of gray cardstock in-behind the wing and then pulled it out to add more dimension before attaching it to my main image on the card front. The scarf is paper pieced using the same designer paper as the background blocks (love this paper!). I added clear stickles to represent the ice. Hope you like. Loll, I agree the image is adorable and you are a true expert at paper piecing. I tried some today and it certainly didn't look like this-I need a few lessons from you. So adorable - love your pattern paper choice! Such a sweet little guy Loll. 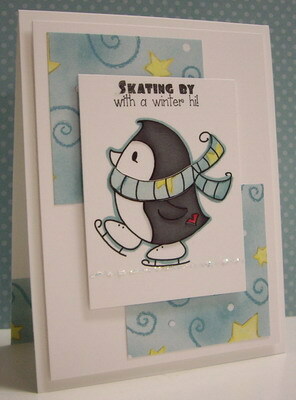 Love the paper piecing and your use of stickles to make the ice appear more real. Gorgeous card as always. You called him adorable and took the words right out of my mouth, Lolly! Your paper piecing is so precise and your choice of patterned paper is so fun!! 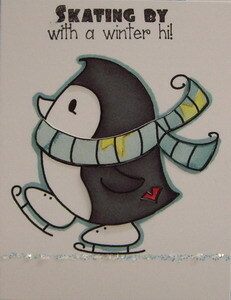 Such a cute penguin Loll - just love the way you've paper pieced him. Hope you and your family had a lovely Christmas. Happy New Year to you all. Thanks for entering your cute creation into our Seasonal Challenge at Bugaboo's Catch the Bug challenge this week. Good luck in the draw. We hope you join us in the next challenge too. Just adorable!! CONGRATS on being one of our winners at Bugaboo!! Thanks so much for playin' along with us this week for the Catch The Bug Holiday Challenge with Bugaboo Stamps! 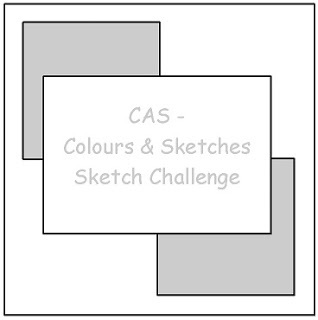 We hope you join us again for our NEWEST challenge.